After a lifetime of teaching Art and Craft, I am now enjoying having the opportunity to concentrate on producing my own ceramics. The question was would I produce functional or decorative work and, finding it difficult to make that decision, I decided that an outcome incorporating both of these would suit me best. For most of my life I have lived close to the coastal area of Devon and Dorset, so the marine life found in the sandy coves, on the rugged rocks and in the tidal pools has long been an inspiration in my work. I concentrate on representing the textural qualities of each element. The work of the sixteenth-century potter, Bernard Palissy, and the contemporary potter and ceramicist, Kate Malone, have also influenced my work. Using stoneware clay, I produce a range of pots, platters and planters, all based on a Jurassic theme. The shapes for my pieces are organic, mainly based on curves, emulating the open, undulating areas of the coastline. The surface of the clay is impressed with found items from the shoreline. 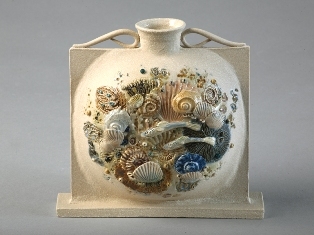 Sculptured forms, such as shells, fossils, seaweed, fish and crustaceans are then added for surface decoration. The concave and convex surfaces of the finished form provide a tactile experience when held. To decorate with colour, I use a variety of materials such as oxides, stains and under-glazes. After bisque firing, both coloured and clear glaze are applied, with the addition of crushed glass. Overall these applications help to enhance the depth of colour and give an encrusted and three-dimensional effect. Finally the pieces are fired to 1240 degrees C. No two pieces of work are identical. Examples of my work can be seen on my Gallery page. I have also created a range of porcelain jewellery to complement this genre. Sterling silver findings are used to enhance each item. I am now working on two new ranges of work. The first is an extension of the above, still using stoneware clay and concentrating on impressed surfaces. The vase-like shapes have now two purposes. They can either be used decoratively or turned upside down and be used purposefully as candle holders. The second new range is quite a departure from my textured surfaces. Using terracotta clay, fired to 1100 degrees centigrade, I am producing a range of pots and platters, with a colourful glassy surface, using a variety of coloured slips, underglazes and stains. Both of these are ongoing projects.